Dr. Ackermann received his osteopathic medical degree from Nova Southeastern University College of Osteopathic Medicine in Davie, Florida in 1995. He performed his internship at Florida Hospital East in Orlando, followed by his internal medicine residency at Franklin Square Hospital Center in Baltimore, Maryland, where he was elected by his peers as chief resident. After finishing his residency in 1999, Dr. Ackermann completed a four-year fellowship in cardiology, including a year of research, at Mount Sinai Medical Center in Miami Beach, Florida, where he served as chief fellow during his final year. After his fellowship, Dr. Ackermann joined a group cardiology practice in south Broward County, Florida before founding the South Florida Institute for Wellness and Health in 2006. He specializes in non-invasive cardiology with a strong interest in cardiac imaging, particularly in echocardiography. Dr. Ackermann is board certified in internal medicine and cardiovascular diseases, and he is a fellow of the American College of Cardiology. 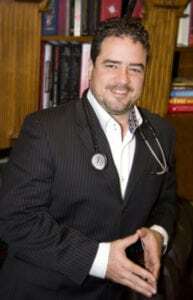 He is also a diplomate of the National Board of Osteopathic Medical Examiners. From 2007-2009, Dr. Ackermann served as the chief of cardiology at Aventura Hospital and Medical Center. He is currently a District 4 Representative for the Dade County Medical Association. He is also a member of the American Society of Echocardiography and the American Heart Association. As a physician, Dr. Ackermann’s philosophy is simple: To listen and to care. "Without a doubt, the most impressionable and lasting first lesson I received took place on the very first day of medical school. It was all encapsulated by one single word expressed by the late Dr. Matthew Terry, dean of the medical school: EMPATHY,” says Dr. Ackermann. “The simplest of this definition is the essence of what makes a great physician. This is the reason why I do what I do. I am privileged to have the opportunity and the responsibility to assist fellow human beings. This is not always easy, yet curiously rewarding." A native of Colombia, Dr. Ackermann has been a resident of South Florida for over 30 years. He is married with three children, and he enjoys cooking and listening to music. To make an appointment with Dr. Ackermann, call South Florida Institute for Wellness and Health at (305) 935-5101, or you can use our interactive form to request an appointment online.